Chuck Berry was not my favourite musician. Seems like a strange statement to start a piece mourning the loss of a great doesn't it? It's true though. Outside of Johnny B Goode and Roll Over Beethoven I would struggle, like many of you if you're honest, to name another two tracks. No, Chuck Berry wasn't my favourite musician. 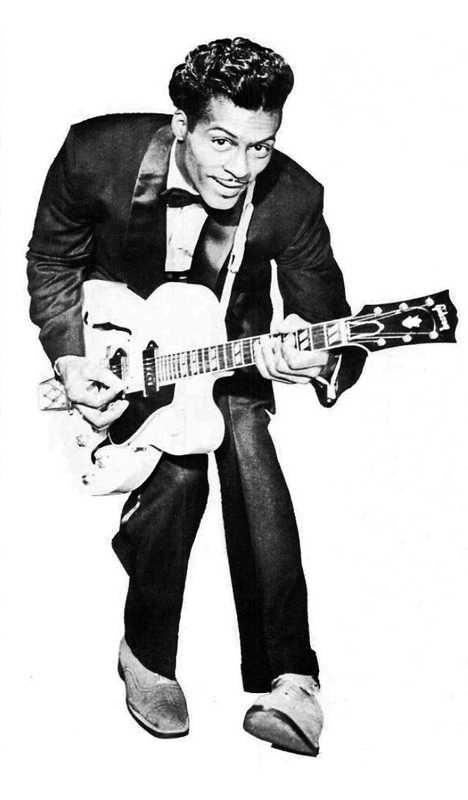 However, without Chuck Berry redefining music I wouldn't have any favourite musicians. There would be no Billy Joel, no John Lennon, no rock music. They just wouldn't have happened. All music goes through changes, that's the nature of growth and of art, but Chuck Berry brought a change that was rapid, that inspired, that saw shifts in everyone that wanted to be a recording artist around the world in a matter of seconds. Guitar solos? We all love them, even drummers, but without the undeniable talent and flair for performance that Chuck Berry exuded you wouldn't have modern song structure, you wouldn't have Steve Vai or Pink Floyd. Teen angst is not a new thing brought about by emo bands (I hate that label), Berry was writing about growing up nearly 50 years before young people realised they may not enjoy school/consumerism/relationships. Chuck Berry pretty much brought about the Rock and Roll Hall of Fame, he was its first inductee, and now he's at the ever growing jam night in the afterlife. Chuck Berry is not my favourite musician but he gave my favourites the tools in which they could do their job and for that I will be forever grateful.